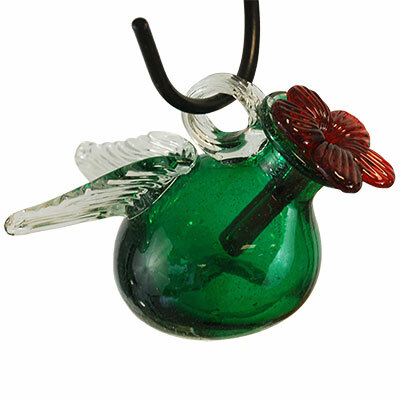 Enchant hummingbirds with a dramatic feeding station using the Parasol Green Pixie Hummingbird Feeder. This adorable piece adds whimsy to your backyard in moments, with its rounded shape and flying motif. The deep green, glass vessel evokes a pitcher, with a flattened base and extended neck. This reservoir holds 4 ounces of nectar, and a red, glass feeding flower inserts into the long neck, allowing hummingbirds to dine one at a time. Two wing shapes extend from the back of this vessel, helping the unit maintain its fairy-like form. Textured lines within the clear wings lend dimension and drama to this piece, attesting to the artistry of its creator. Made from recycled glass, the hand blown vessel and flower bring environmental awareness to your garden as well as levity and style. The glass body cleans easily, while the open neck makes refilling the unit a breeze. Use the included, 2.25" long "S" hook and blown glass loop to hang this feeder from a bracket or branch in moments. Add a storybook hint to your backyard with this Green Pixie Hummingbird Feeder. Note: As each vessel is hand blown, individual items may vary slightly in size.